New: WordPress Gutenberg support for all eForm shortcodes. Just activate eForm with your purchase code and receive automatic updates, for lifetime, for free! Form Settings: Use the tabs at the top to name your form, select a form type and customize the settings. We have included over 30 themes to get you started, and you can also play around with different fonts and sizes. Form Elements: Over 35 awesome form elements are shown in a list on the right hand side. Simply add a container and drag the elements you want to include. 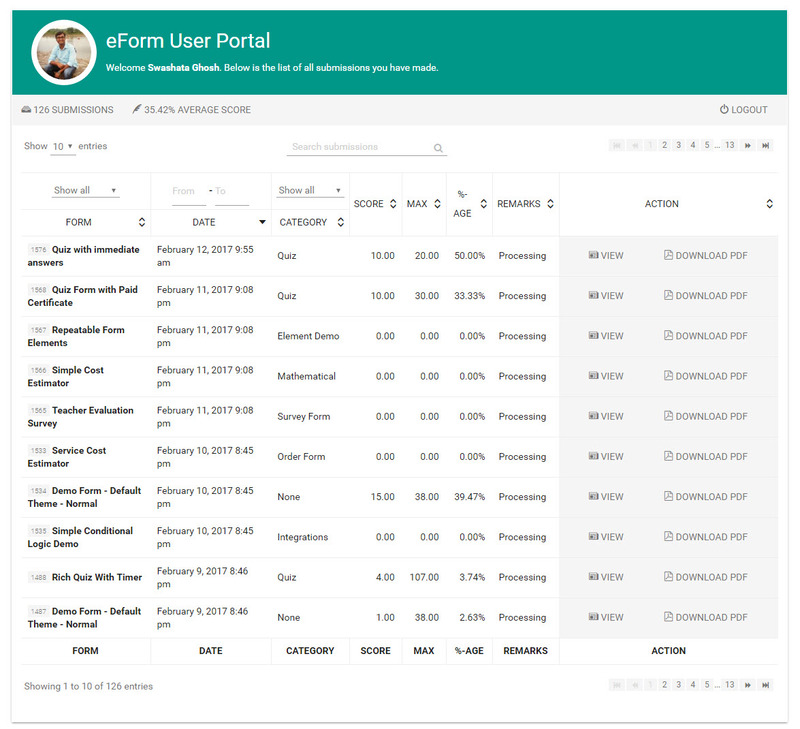 Form Layout: On the middle of the screen you can arrange the layout of your form. Add several containers and then drag and drop elements to build your preferred layout. The form builder will automatically save your layout at regular intervals, so you won’t lose any of your changes. Element Settings: Once you click on an form element, the settings will open up on the left hand side of the screen. 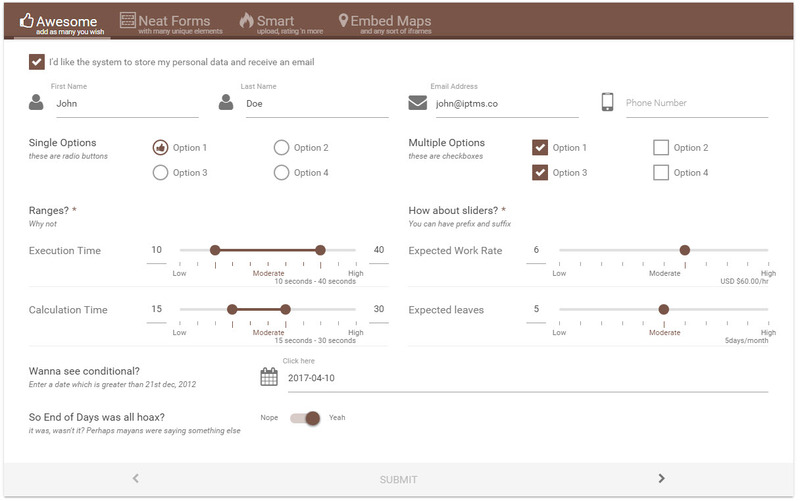 It can have, appearance, interface, items, validation and logic sections from where you can customize how the form element would work. With version 3.5 we have completely reshaped all our form elements with over 38 material inspired themes, which includes both light and dark color schemes. 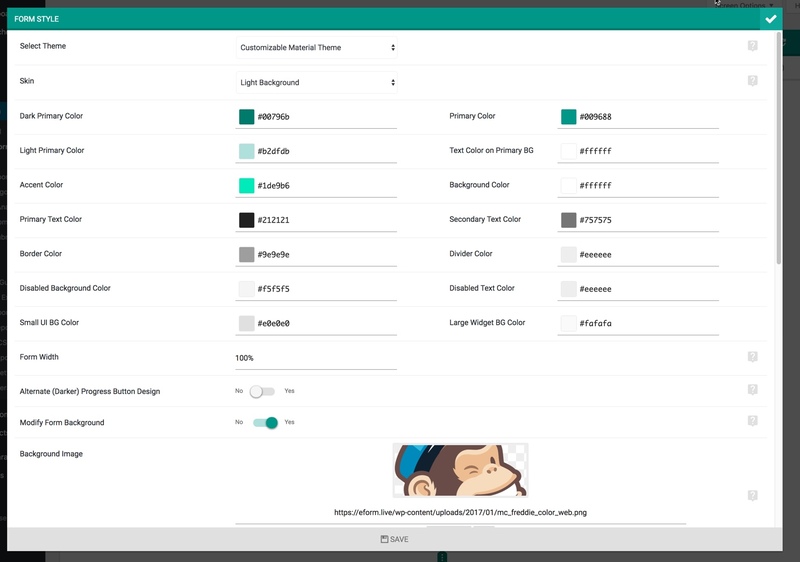 We even have a customizer from where you can pick your color and create your own theme. All previous themes has been deprecated and removed. If your forms were using one, it will be upgraded automatically. We plan to revamp Bootstrap theme and add more skins in future. 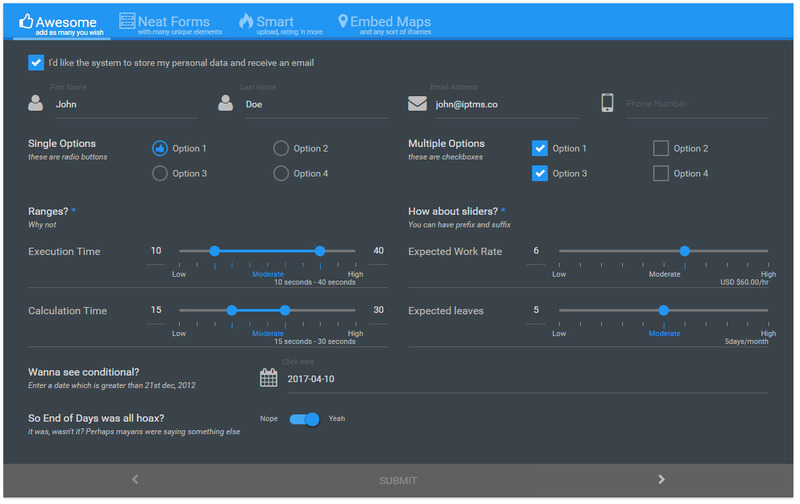 eForm v3.5 comes with a new form element, called Repeatable Element. You can use this to give users option to add more “rows” to the form. Every repeatable element can have any number of elements from radio, checkboxes, dropdowns or texts. Given the option, your users can repeat the grouped elements in any number they want. Of course we have provided configuration for limiting repeats between a minimum and a maximum value. You can now assign scores and ranks to your users, based on their submissions (for example, for score-based quizzes). Adding score-able elements is quick and easy, and the system will automatically generate the total score for each user. For freetype answers, you can review and manually assign scores so that these can also be taken into account. 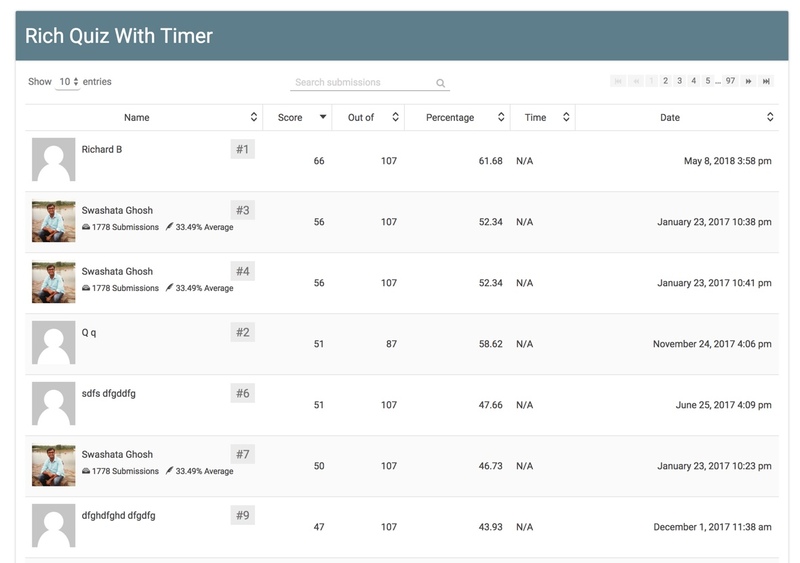 You can view the scores and rankings from your dashboard, and you may also choose to allow users to view the results from their portal. Based on the scores, you can automatically assign different designations to users (eg. “rookie” or “expert” etc. ), and can configure your form so that a different message is displayed, depending on the user’s score breakdown. This can also be useful for tailoring user notification e-mails, or to send targeted e-mails to users of a certain ranking/designation. Correct and incorrect answers can be highlighted in the user’s e-mail notification and trackback page, when they review their submission. You can even allow users to download a printable certificate, with the help of the Exporter addon. With eForm v3.6 you can let your user login, register, update metadata and/or submit guest blogging from eForm. All of the elements would be themed properly and would look nice and seamless within your website. The integration registration and guest blogging effectively allows you to let your users register and submit a guest blog at the same time. If the user is already registered and logged-in then eForm would not show the registration fields. You can also add custom meta values from other eForm elements while doing a registration or simply update meta values for logged-in users. Read more about it here. Get and Prefill Freetype & MCQ Elements from User metadata. Update User metadata on form submission. As you add elements in the form builder, you can set their initial state as “shown” or “hidden”. 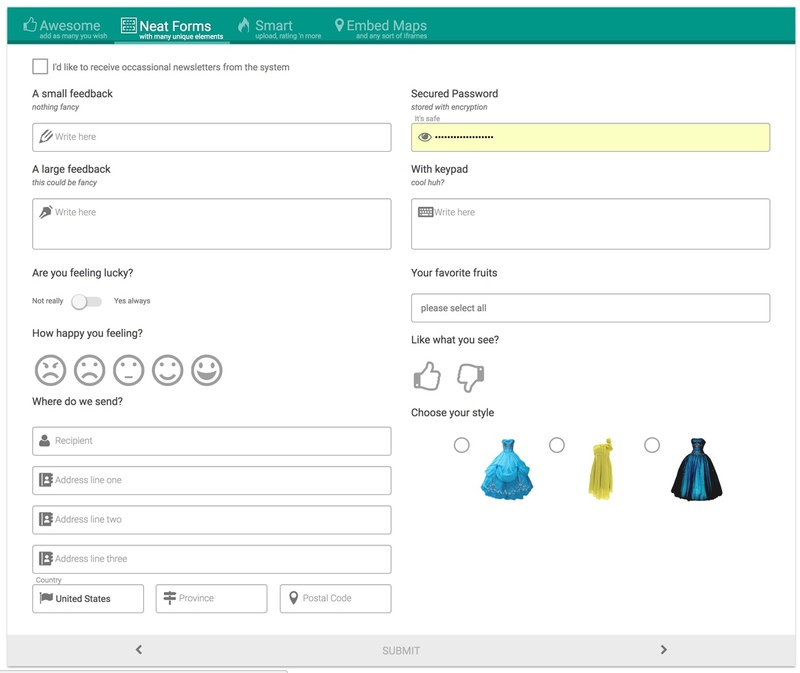 You can then configure your form to be responsive to each user, and new elements can be shown or hidden according to their previous answers. Simply define each of your elements (eg. as a Multiple Choice Question or Feedback & Upload) and apply your own rules to any element or group. Multiple logics can be combined for more complex personalization. Conditional logic and conditional validation rules ensure that your forms are smart, relevant and effective, saving you and your users time and collecting the data you really want. We have included a Mathematical Evaluator element, which allows you to calculate complex formulas instantly. You can drag this feature from the elements list in the form builder and add it to your form. Input your own formulas, and the mathematical evaluator will do the rest! You can either assign numerical values to existing elements (eg. prices for items), or use numerical elements so that the user has to enter or choose a numerical value (eg. a rating). 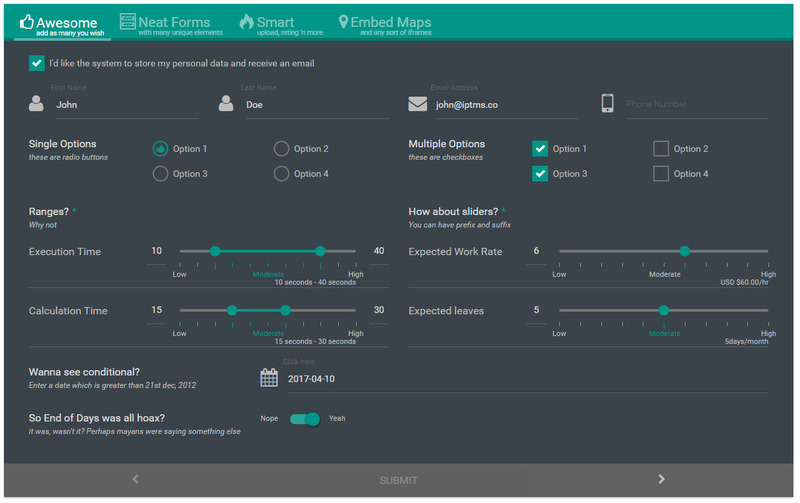 With eForm form builder, you can request that users upload files as part of their submission by simply dragging and dropping the file over the form. Every file upload generates a unique identification number, through which further actions can be taken. The file uploader is fully secure and will not accept any potentially harmful or risky files. When a user uploads a file it is stored in your wp-content/upload directory, and not in our plugin directory, so it is automatically protected by your own security settings. With the help of eForm mathematical evaluators and numeric elements, you can easily create complex and also simple cost estimator forms. Take numeric values from MCQs and sum it up or enter your own arithmetic formula to estimate cost. Once estimation is complete, use the eForm Payment System or Built-in WooCommerce integration to collect payment. Check our demo for a range of cost estimators & payment forms. All user submissions are stored in your database, so you have complete access through your admin dashboard and can view, sort and/or edit the data any time you want. You can also choose to give registered users the ability to browse and edit their own submission through a portal page. All forms are submitted securely, and spam bots will always be ignored, so you can be sure that you are capturing genuine feedback/data from your users. For added security, you can add a captcha element from the form builder. 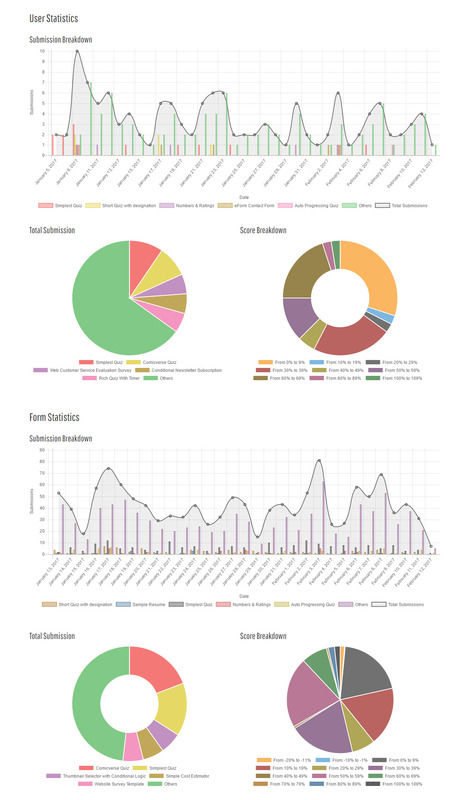 From your admin page, you can view and configure detailed statistics, charts, graphs and graphics to interpret your captured data. Browse submissions in detail, view summaries, and run in-depth reports and analysis using survey analytic tools. You can also export the reports or CSV using the Exporter Addon. If you just want a CSV of submissions, then with eForm v3.4 you do not need to get the exporter add-on. You can just get this functionality built-in. Our beautiful and responsive notification e-mails are clean and minimalist in design, so you can personalize them to suit your own branding style. Easily change the logo, form header image and e-mail accent color from your admin dashboard. You can then fully customize the notification message – for example, you may want to thank users for taking your quiz or survey, and let them know how to log in, view their submission, or take another quiz. You can also set up admin notification e-mails and configure your settings from the dashboard. It is also possible to hide notification email and show a payment retry link for incomplete or unpaid submissions. This is great for creating paid and certified quizzes. We have also integrated our form builder with both PayPal and Stripe, so that you can take fast and secure payments. Use the simple toggle on your admin dashboard to enable one or more payment systems, enter a mathematical formula for calculating the total, and set the currency code. 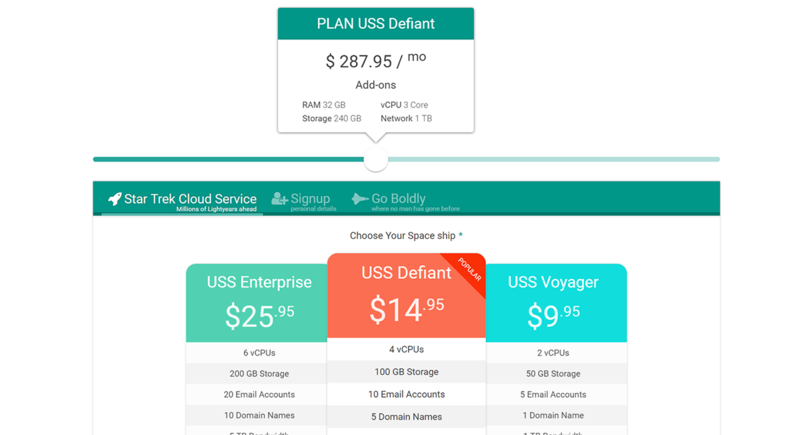 Customize product names, numbers and invoice IDs, and the form builder also allows for custom coupon codes for discounts. eForm v3.4 has taken the payment option a step further by integration with the very popular WooCommerce plugin. With eForm you can modify the price of any existing WooCommerce product on the go (depending on any mathematical element) and automatically add product attributes to the order. 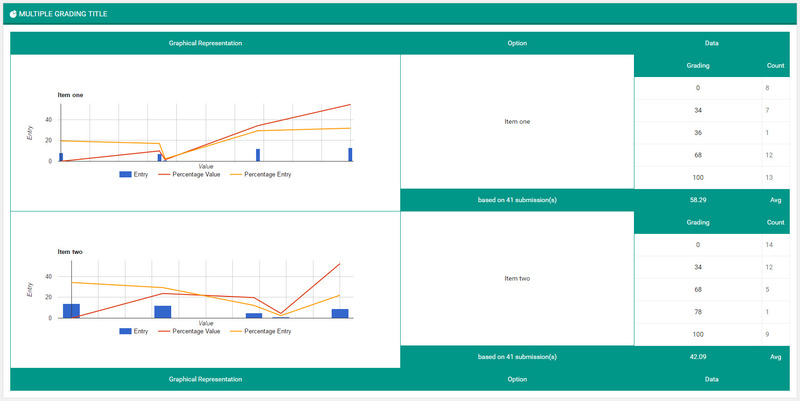 The attributes are generated from the variables you have used on the mathematical formula. Once the form is submitted, the user is taken to the cart or checkout page for completing payment. Check our knowledgebase to learn how to easily setup WooCommerce integration. eForm v3.5 now has the ability to send data to custom URLs. 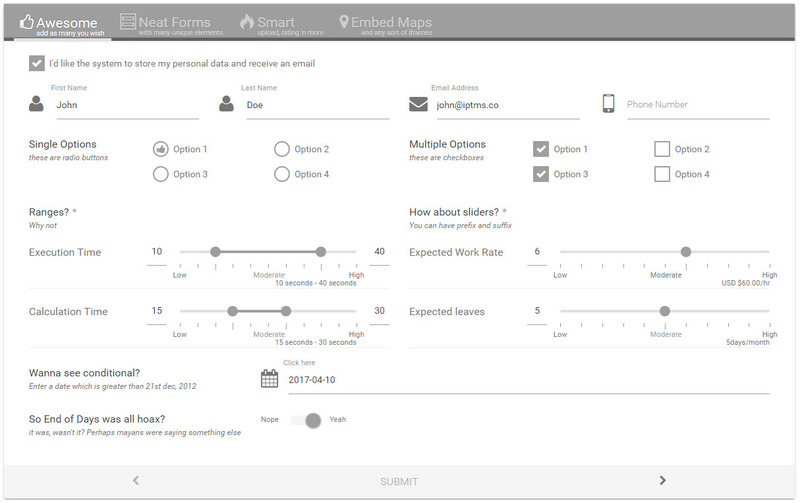 You can choose any elements from your form and send its data through a custom parameter of your choice. You can even change the HTTP method to GET or POST. This works good for SSL too. Many form elements can now have default values set. These include, single options, multiple options, thumbnails, dropdowns & freetype elements. Moreover freetype elements can have their state as readonly. You can read more about it here. We understand that reading through heaps of documentation can be tedious and time-consuming, so you’ll see a help icon beside every element in the form builder to guide you through the features you want to use. Video tutorials and full support documentation are also available, giving you step-by-step instructions and screen shots, so that you can get the most out of your eForm WordPress form builder. PHP version: 5.4+ (Required for eForm v3.3+. PHP 5.2 and 5.3 would not work anymore.). Recommended PHP 7.2. Recommend PHP Memory Limit: 128M or more. But also should work on 64M depending on number of plugins. Since version 2.x, the pro plugin can work in parallel with the free plugin. However, the pro plugin will not import any data from the free plugin, so if you wish to, you must do so manually. It is recommended that you delete the free plugin before installing the pro, as you will no longer need it. It is not possible for us to make the plugin compatible with every theme on the market. If your theme has followed the WordPress standard of coding, then this plugin will definitely work. Your theme or any other plugin has changed the WordPress default jQuery file. Your theme or any other plugin has changed the WordPress default jQuery UI files. Your theme or any other plugin is including a different copy of jQuery or jQuery UI from its own resource. Whatever the reason, it is not a standard way to change any of the default inbuilt WordPress files. If the form does not seem to work with your theme, please open a thread in our Support Forum. We will assist you with contacting the developer of your incompatible theme/plugin to fix the problem. We have also published a series of troubleshooters, which may come in handy. 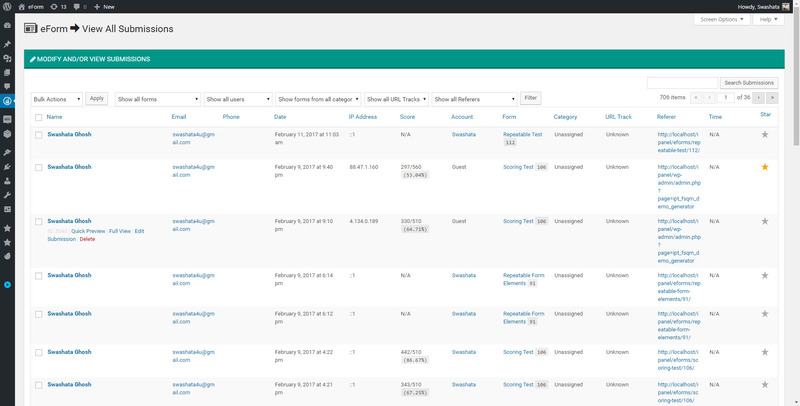 Please refer to the working admin demo to see the exact features you will be getting, before you buy. If you think we have overlooked a valuable feature, you can open a thread on our Support Forum. If we see that the feature is really important to the community, then we will do our best to add it to a future version. -   **Update** - Make eForm work in conditions where some JS libraries are removed by themes or plugins. -   **Fix** - Regression of payment form from last release. -   **Fix** - DIVI theme compatibility. -   **Fix** - Style flash of form loader. > Improvements for Gutenberg blocks and general bug fixes. -   **New** - Option to resubmit webhook during form update. -   **Update** - Improve eForm Login forms. 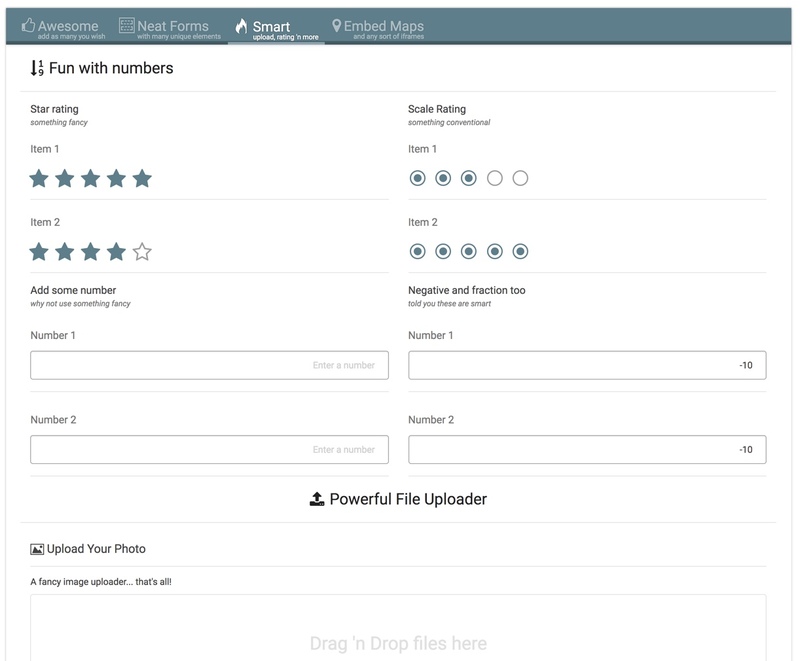 -   **Update** - Improve performance and asset loading for standalone form pages. -   **Fix** - Form Trends Gutenberg block. -   **Fix** - Category and form filter under User Portal. -   **Fix** - Missing validation in Stripe Payment Gateway. -   **Fix** - Stripe subscription issue with multiple API keys. -   **Fix** - Multiple network request on same CSS file. > Datepicker improvement and general bug fixes. - **Fix** - If payment amount is 0, it will not trigger payment. - **Fix** - Special characters breaking conditional logic on server side. - **Update** - Today button will set today's date for datepicker. > Form builder & MCQ improvements. - **New** - Option to collapse the form builder sidebar. - **New** - Button like appearance for radio and checkboxes. - **Update** - Form score now supports fractional values. - **Fix** - Server side conditional logic for password elements. - **Fix** - Limitation message not visible for logged-in users. - **Fix** - Manual submit button not working on single page form. - **Fix** - TinyMCE toolbar not visible under form builder settings. - **Fix** - Typo in Text element settings. - **Fix** - Signature element buttons. - **Fix** - Column alignment in material style. - **Fix** - File uploader upload button click area. > Convertkit Integration, Migrate to WooCommerce CRUD API & manual form buttons. -   **New** - Add option to hide default Form Submit toolbar. -   **New** - Convertkit integration with support for forms, sequences and tags. -   **New** - New Buttons element to make form progress, jump to page, submit etc. -   **New** - New preset datetime related variables for math element. -   **New** - Option to disable eForm admin side sandboxing. Fixes conflict with wp.com hosting. -   **New** - Option to hide password field values from summary table. -   **Update** - Always encrypt the values of password field. -   **Update** - Improve CSS build system by using autoprefixed SCSS. -   **Update** - Migrate WooCommerce integration to the new CRUD system. No more deprecation notice. -   **Fix** - Allow dash(-) in name validation. -   **Fix** - Math element fancy tag issue on single page forms. -   **Fix** - Piping tags not appearing for freetype elements in summary table. -   **Fix** - Use elements from freetype for registration username. -   **New** - eForm can now accept product variation id. -   **New** - You can select multiple order status to mark as paid. -   **New** - Compatibility with WordPress Gutenberg. 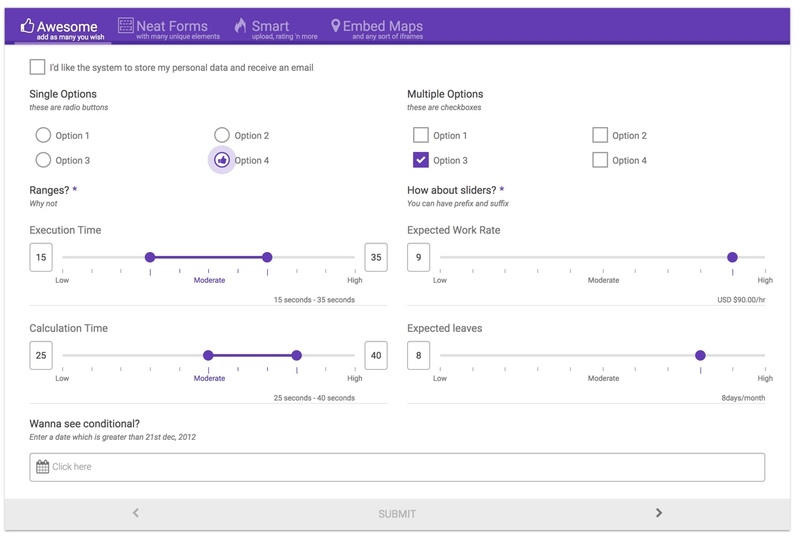 -   **New** - Major improvement and complete rewrite of form builder UI and UX. Check our onboarding video. -   **New** - More styles for progress buttons. -   **New** - Onboarding tutorial when accessing Form Builder for the first time. -   **New** - Optionally show WooCommerce payment status in summary table and in admin side View all Submissions. -   **New** - Sandbox eForm admin pages from other plugins to avoid conflict. -   **New** - Various new form templates. -   **Update** - Sane default for a few form elements, including imageslider, thumbnail picker etc. -   **Update** - Skip WooCommerce if product_id is empty, creating room for conditional one-page or WooCommerce checkout. -   **Fix** - Center alignment for credit card container and stripe. -   **Fix** - Datetime element not working in live form view. -   **Fix** - Form Configuration being closed when uploading image. -   **Fix** - Issue with CONFIG and STYLE change refresh. -   **Fix** - Issues with Link Button form element. -   **Fix** - Regenerate form custom css when version upgrades. -   **Fix** - Set form width unit to pixel, when none is supplied. -   **Fix** - Show error message when reCaptcha is not being set up correctly. - **Fix** - Empty feedback issue when sending on-behalf of user. - **Fix** - Issue with security reCaptcha element. - **Fix** - Issue with "Submission Limited" forms not appearing within form builder. - **Update** - Improvement for custom style generation (with checksum). - **Update** - Improve response time of live form builder. - **Update** - Improve UX of live form builder. * **New** - Live form builder interface. * **New** - Boxy form themes. * **New** - System and Custom fonts support. * **New** - Global element alignments. * **Update** - Accessibility for various form elements. * **Update** - Update MyMail to Mailster. * **Fix** - Math element appearance issue on small devices. * **Fix** - Invalid hashtag breaking popup. * **Fix** - Blank feedback email when send from user is true. * **Fix** - Localize GetResponse PHP Library to avoid Fatal errors. * **Fix** - Address box alignment issues. * **New** - Support piping tags in pricing element header, attributes & footer. * **Fix** - A case when hidden element won't restore value if placed inside a container with duplicate conditional logic. * **New** - Integration with MailWizz Application. * **New** - Offline Payment Gateway integration. * **New** - Remove mcrypt dependency with graceful fallback for older instances. * **Update** - Option for natively using Mobile Camera with File Uploader. * **Update** - Update to new Stripe API for subscription. * **Fix** - Full Name Element validation issue with "Everything" filter. * **Fix** - Leaderboard and User Portal responsiveness issue. * **Fix** - Math element fancy appearance issue with hidden label. * **Fix** - Sortable list icons not appearing in summary table. * **Fix** - JS bug with dependent datepicker element. * **Fix** - CSS issue with datepicker div, not being hidden under some theme. * **Fix** - Compatibility issue with easySubmission add-on. 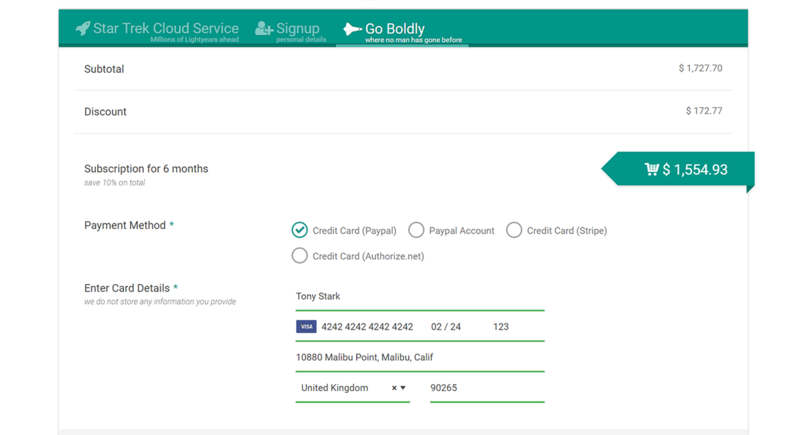 * **New** - Subscription Payment with Stripe. * **New** - Option to highlight all positive scores in summary table. * **New** - Option to reverse the order of smiley rating. * **Fix** - Appearance issue with styled container without icons. * **Fix** - Bug in iFrame/GPS inside hidden/collapsible containers. * **Fix** - Missing prefix and suffix in feedback small inline appearance. * **Fix** - Make Center/Vertical appearance work for payment element. * **Fix** - Hidden Stripe Payment causing JS error. * **Fix** - Primary fields not getting disabled after adding to the form. * **Fix** - GetResponse Integration now updated with v3 API. * **Update** - Improve Auto-Update and error reporting functionality. * **Fix** - Issue with Guest Blog element placeholder. * **Fix** - Issue with Guest Blog Editor toolbar modals. * **New** - Option to disable eForm activation notice. * **Fix** - Issue with payment retry form. * **Fix** - Issue with ZIP code field not accepting alphanumeric codes. * **Update** - Move `hiddens` method to `IPT_Plugin_UIF_Base` to expose to all classes. * **Update** - Updated Composer dependencies to latest (`Stripe`). Please check the changelog file for detailed changelog and file changes. Thank you for your interest in WP eForm Plugin. The following Tools were used during the development of this project.